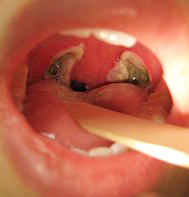 Often, patients become disturbed with the way their throat looks after a tonsillectomy. However, many of the concerns are unfounded and the appearance though disturbing, is actually normal. The white plaques where the tonsils used to be are actually scabs. Just like a scab on a cut elbow turns white after taking a shower or swimming, the scabs in the throat/mouth turn white from the saliva. Also, the uvula is swollen (3-4X bigger than usual) which also is normal and will improve over the weeks. Hopefully, the NORMAL pictures shown here will reassure patients who are concerned with their throat appearance after tonsillectomy. These particular pictures were taken 1-7 days after tonsillectomy. 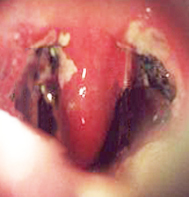 To see pictures of what abnormal bleeding after tonsillectomy looks like, click here.